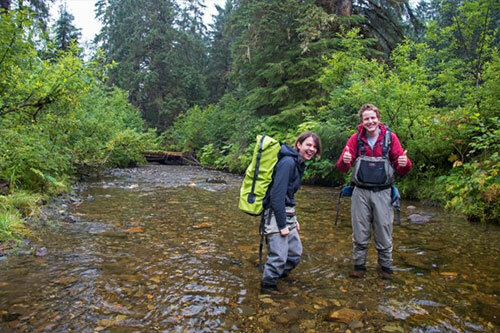 (SitNews) Juneau, Alaska - University of Alaska SE senior Mollie Dwyer spent her summer hiking up mountains with a backpack of test tubes to collect water samples from different stream sources. Last year she had her hands full of kelp assisting with research on their reproductive process. Thanks in big part to her scholarship from Coeur Alaska Inc. Dwyer, a senior pursuing a B.S. in Environmental Science, Dwyer was able to dig into her studies quite literally during a paid internship through a collaboration of the US Forest Service, the Alaska Coastal Rainforest Laboratory and the University of Alaska Southeast. She is the latest recipient of the $2,000 UAS Coeur Alaska – Kensington Gold Mine Environmental Science Award which has just received another $20,000 donation from Coeur Alaska Inc.
UAS Environmental Science senior and Coeur Alaska scholarship recipient Mollie Dwyer, left to right, stands with Coeur Alaska donor Jan Trigg, UAS Professor of Environmental Science Eran Hood, Ph.D and U.S. Forest Service Research Aquatic Ecologist Rick Edwards at the Juneau Forestry Sciences Laboratory in Juneau, Alaska Friday, Aug. 20, 2018. Pursuing a B.A. in Environmental Science, Dwyer is doing what many UAS students pursue - hands-on internships that take advantage of community partnerships. Currently Dwyer is assisting Drs. Eran Hood and Jason Fellman along with U.S. Forest Service Soil Scientist David D’Amore in research that may provide clues to how changes in our environment impact Southeast Alaska both environmentally and economically. The Alaska Coastal Rainforest Center, hosted by the US Forest Service and housed in the Juneau Forestry Science Laboratory, was established in 2009 with a goal of expanding and enhancing education and research opportunities for university students with a focus on the environmental and economic climate of the Pacific coastal temperate rainforest. UAS Environmental Science Students Mollie Dwyer (left) and Connor Johnson trek through Montana Creek to obtain water samples Thursday, Aug. 23, 2018 in Juneau, Alaska. 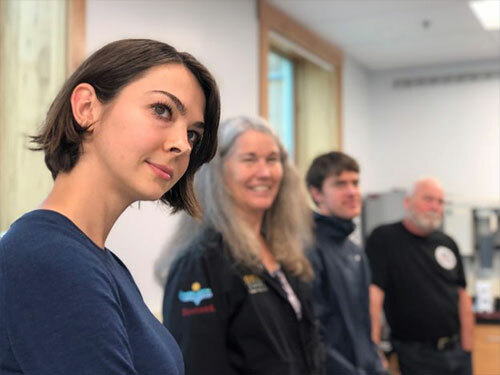 "Mollie's participation in our research project has provided her with valuable hands-on experience in aquatic ecology and helped to foster collaboration between UAS faculty and researchers at the Juneau Forestry Science Lab" says Dr. Eran Hood, professor of Environmental Science. D’Amore says the collaboration between the US Forest Service and the university was no accident, the Juneau Forestry Sciences Laboratory was carefully planned and built on property adjacent to the UAS Juneau campus with a walking path that connects the two. Two house poles honoring the heritage of the Auke Kwan land and carved by now UAS faculty member Wayne Price grace the entryway. Together with the private support of Coeur Alaska Inc. these separate entities are combining resources and creating what Jan Trigg of Coeur Alaska describes as a synergy that is precisely what her company hopes to contribute to. “The whole idea behind creating the scholarship endowment is that we can contribute something that is sustainable and can help students long after the mine is gone.” Trigg said. In total Coeur Alaska has donated $124,000 to UAS and a total of $156,700 to the University of Alaska system since 2011. They have given $4,000 in a joint scholarship with HECLA and Southeast Conference and $32,700 to University of Alaska Anchorage for visiting professors of public policy. To add your support for student scholarships and other program support, contact the UAS Development Office at (907)796-6320 or go to www.uas.alaska.edu/development.